Whack A Jackpot Scratch Card Guide & Review - Casino Answers! 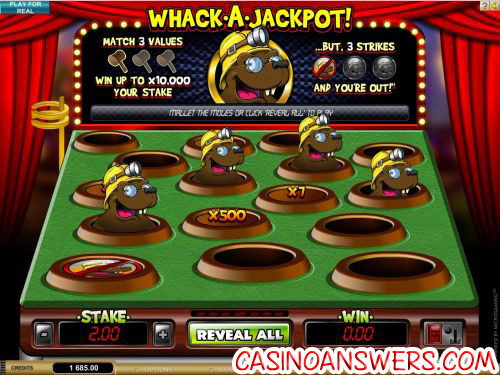 Whack A Jackpot is an instant win scratch card game developed by Microgaming. You can play the Whack A Jackpot instant win game at Grand Hotel Casino and King Neptunes Casino. To start playing Whack A Jackpot, you must select your bet (or stake) of $0.50 or any increment of a dollar up to $10. Once your wager is selected, you will hit the “New Card” button to start the scratch card game. Once you start, you will see the moles (complete with miner’s helmets) popping out of their holes. Unlike the true Whack A Mole arcade game, you do not have to worry about missing them, as they will eventually all pop back up. Besides winning real cash, that might be the best part about playing Whack A Jackpot at Grand Hotel Casino. When you hit a mole in Whack A Jackpot, a multiplier value will be revealed. The goal is to match three values before you get three strikes. Strikes are when you hit a mole that instead of giving you a value gets stunned. In addition to getting 3 strikes, you do have a finite amount of moles that you can hit. There are only 16 moles in the game. Alternatively, you can use the “Reveal All” button to cut to the end of the game by revealing all of the holes. Multiplier values in Whack A Jackpot are as follows: 10,000X, 5000X, 1000X, 500X, 250X, 100X, 50X, 30X, 15X, 10X, 7X, 5X, 3X, 2X and 1X. By hitting the top jackpot of 10,000X on a $10 bet, you can win up to $10,000 playing the Whack A Jackpot instant win casino game. If Whack A Mole is one of your favourite arcade games, the chances are that you will enjoy playing Whack A Jackpot as well. It maintains the fun of the Whack A Mole game while giving the online casino player the chance to win big. To play the Whack A Jackpot instant win scratch card with a $10 free no deposit bonus, visit Grand Hotel Casino! Are USA players able to play the Whack A Jackpot scratch ticket? Unfortunately, players based in the United States are unable to play at Microgaming online casinos at this time. However, if you are looking for a Whack-A-Mole casino game and also enjoy playing video slots, the Fixer Upper iSlot game has a Whack-A-Mole bonus game. American players can play the Fixer Upper interactive video slot at the US-friendly Slots Jackpot Casino. Where can I play the Whack A Jackpot Flash game for free? You can play the Whack A Jackpot scratch card game for free at your choice of either Grand Hotel Flash Casino and King Neptunes Flash Casino. If I make a $1 bet on Whack A Jackpot, how much can I win? If you don’t exactly consider yourself a high roller and only wish to bet $1 per game of Whack A Jackpot, you can win up to $10,000 per game of Whack A Jackpot. However, if you bet $10 per game on the Whack A Jackpot online scratch card, you can win as much as $100,000! Not bad for a night out at the arcades. Are there any whack a mole type casino games?